“So what could be so controversial”, I hear you cry! 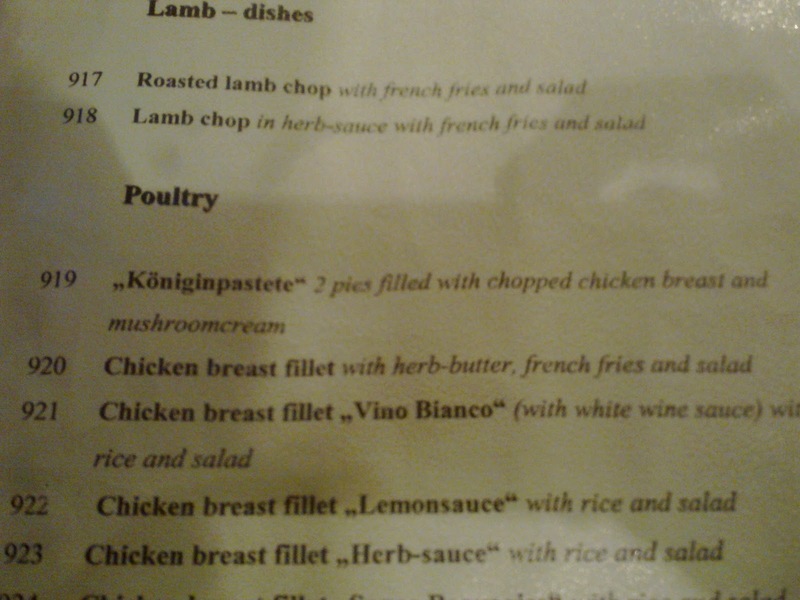 Well, when I ordered “two pies filled with chopped chicken breast and mushroomsauce” from the Hofgarten in Aachen, West Germany, I certainly didn’t get exactly what it said on the menu. The plate below was brought out to me, which in itself doesn’t look too controversial, albeit a bit odd. 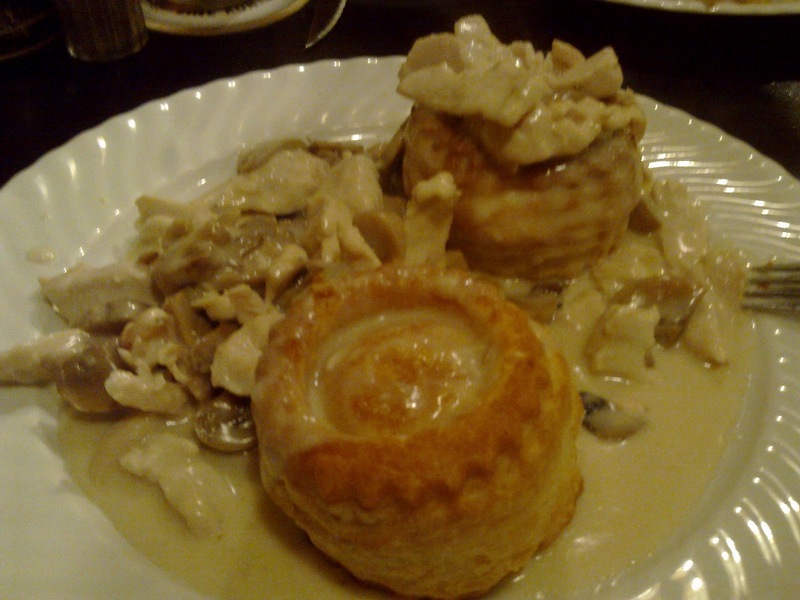 Why was there so much chicken and mushroom on the plate itself, rather than it all being inside the pastry? Perhaps there was just so much filling that it simply couldn’t possibly all fit inside the pastry itself? I started eating. The puff pastry was a delight to eat, so soft and flaky and a brilliant golden colour. The Germans are known for their efficiency, and it looked like time well spent engineering the pastry to a perfect level to make this pie. The filling meanwhile, while controversially outside of the pastry casing, was very nice too, with the sauce complementing the pastry, chicken and mushroom. I found myself being completely dumbfounded, but enjoying every mouthful! 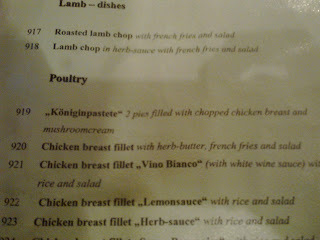 The combination of the pastry pie alongside the chicken and mushroom on my plate was brilliant. It just left me bamboozled as to why the filling of the pie was not inside the pastry itself, as it was some of the best pastry and filling I have ever tasted! The mystery continues...Is this what pies used to be like “back in the good old days!” Was this the pre-cursor to the pie we all know and love today – where the filling of the pie had not quite worked its way into the pastry yet? Or did the restaurant even make a complete schoolboy and forget to put the filling inside the pastry pie in the first place?! While it is difficult to sum up my confusion at this pastry-only pie, it did in fact taste delicious and the real sign of a good pie is that I would happily go back there and eat another one of these pie dishes today, if I had the chance! It’s hard to specifically rate the pastry pie on its own, without the filling taken into account, but the pastry did taste very good and was in fact covered in the sauce and filling (as can be seen from the photo). However even if this was not actually how it should have been presented, what counts is that it was one of the nicest pastry and filling combinations I have ever eaten. And it was still a pie! Sehr gut! continue reading "Have the German’s pre-invented the pie?!" continue reading "The Pierateers hit 10,000 page views!" 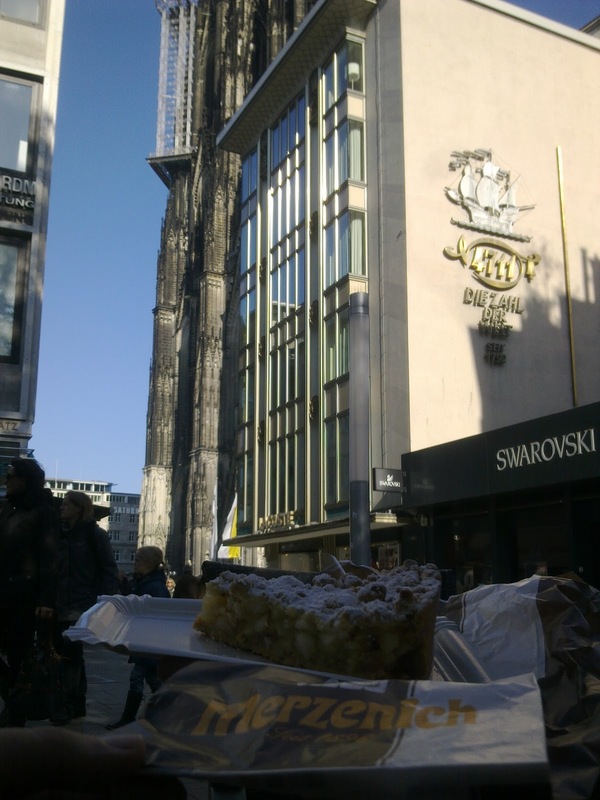 Ist das ein “Pie” mit Köln Dom? Wünderbar! Ich habe Köln (Deutschland) besucht. Es war sehr gut! Für mein Mittagessen aß ich „Apfeltorte“ aus Merzenich. Es war Super! Okay, so enough of the really poor level of German I vaguely remember from School lessons (and thanks to Google Translate for helping me!) 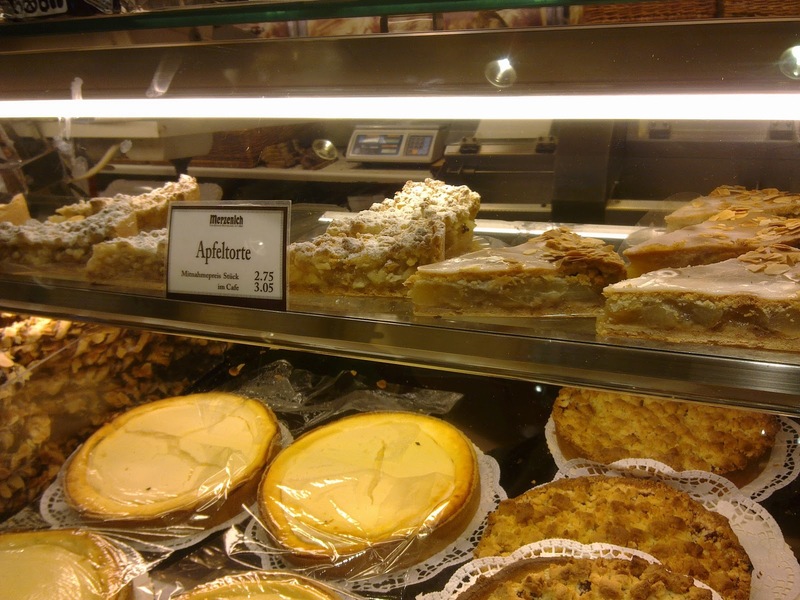 What is important is that, despite calling it in the German an “Apfeltorte”, you can buy a pie in Germany! 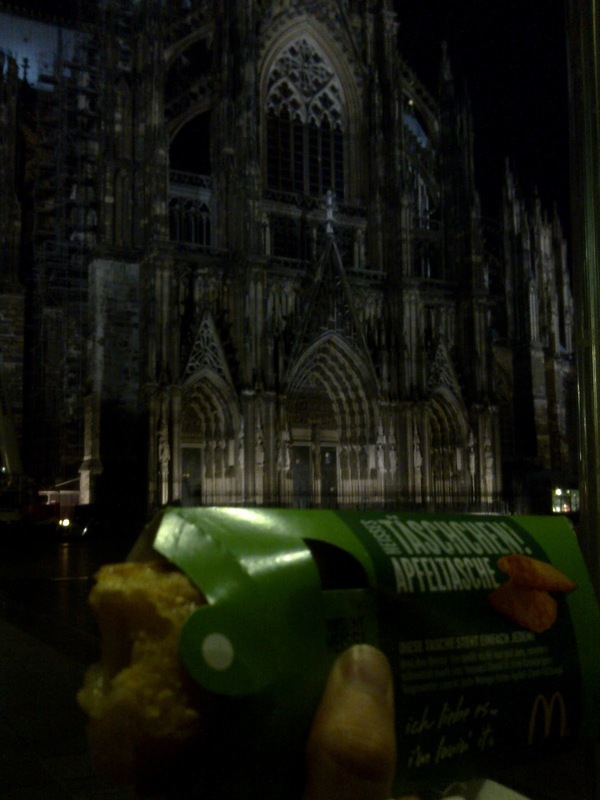 The research was conducted upon a recent trip to Cologne/Köln, in Western Germany. The Pierateer was helpfully assisted by his spy comrade to search out if in fact the pastry loving Germans were fans of the pie. Upon stumbling across a delightful lunchtime eatery in the centre of Cologne, just a stone’s throw from Cologne Cathedral (however I wouldn’t recommend throwing a stone at such a marvellous piece of architecture and world heritage site), the lads found to their delight that Merzenich did indeed sell pies! The pie in question, as seen above, was a sweet apple pie, served per slice but clearly being a sweet apple centre encased in pastry with a clear lid. As such, it passed the “is it a pie?” benchmark which can leave so much foreign produce outside the pie parameters. 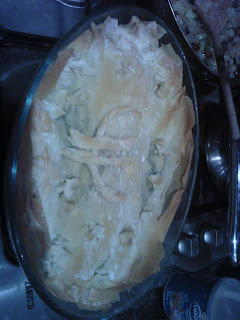 The pie itself was a lovely, sweet apple pie which crumbled beautifully in the mouth when eaten. While not served with anything such as ice cream or custard, the simplicity of the pie was one of its strengths. Nothing needed to be added to the slice of pie, as it tasted delicious just as it was! The pie was certainly on the sweeter end of the spectrum, but this made it a very nice pie to end your lunch with. The beautifully buttery pastry was lovely and golden, crumbling in the mouth. 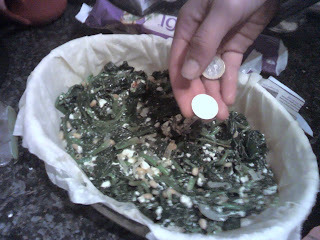 The only downside to it was that it was quite hard to hold, as the slice of pie was almost too crumbly for its own good! 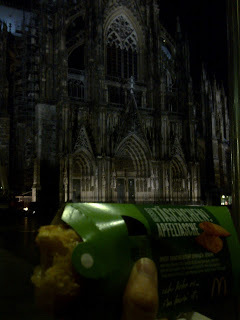 This made taking a photo of the pie – and more importantly, eating the pie – in front of the Cathedral rather a challenge! The pie was delicious to eat and well packed with apple goodness – a sure fire way to get one of your five-a-day. The only other thing to warn you about is that the top of the pie is covered in white icing sugar, which on a blustery day like the one it was purchased on was always going to leave the eater covered in icing sugar themselves. A recommendation would be to wear white clothes, so that it doesn’t show up when you get covered in sugar! 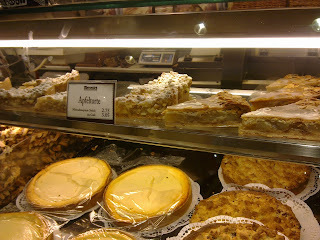 The pie will set you back at least 2.75 Euros, but for the taste sensation it is certainly worth the investment. Wünderbar! continue reading "Is das ein “Pie” auf Köln, Deutschland?" continue reading "Here's to a pros-pie-rous 2012"